The claudin (CLDN) genes encode a family of proteins important in tight junction formation and function. Recently, it has become apparent that CLDN gene expression is frequently altered in several human cancers. However, the exact patterns of CLDN expression in various cancers is unknown, as only a limited number of CLDN genes have been investigated in a few tumors. 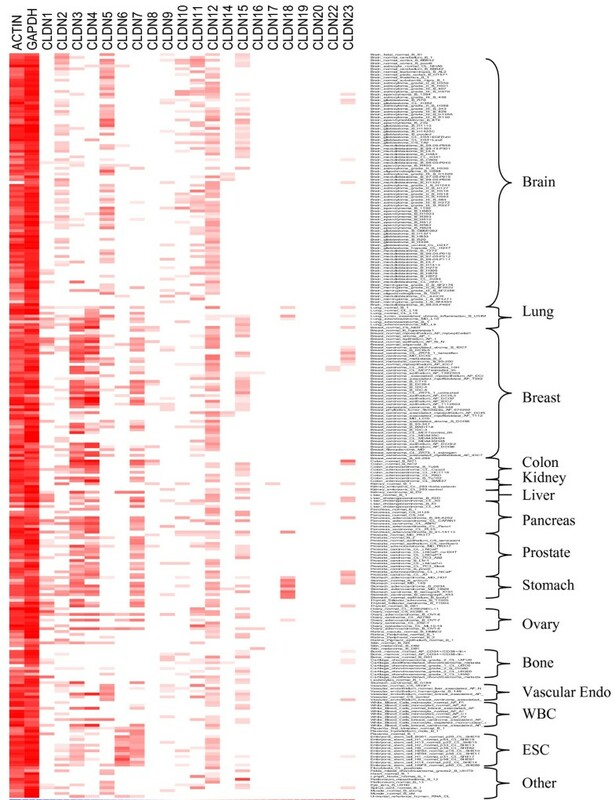 We identified all the human CLDN genes from Genbank and we used the large public SAGE database to ascertain the gene expression of all 21 CLDN in 266 normal and neoplastic tissues. Using real-time RT-PCR, we also surveyed a subset of 13 CLDN genes in 24 normal and 24 neoplastic tissues. We show that claudins represent a family of highly related proteins, with claudin-16, and -23 being the most different from the others. From in silico analysis and RT-PCR data, we find that most claudin genes appear decreased in cancer, while CLDN3, CLDN4, and CLDN7 are elevated in several malignancies such as those originating from the pancreas, bladder, thyroid, fallopian tubes, ovary, stomach, colon, breast, uterus, and the prostate. Interestingly, CLDN5 is highly expressed in vascular endothelial cells, providing a possible target for antiangiogenic therapy. CLDN18 might represent a biomarker for gastric cancer. Our study confirms previously known CLDN gene expression patterns and identifies new ones, which may have applications in the detection, prognosis and therapy of several human cancers. In particular we identify several malignancies that express CLDN3 and CLDN4. These cancers may represent ideal candidates for a novel therapy being developed based on CPE, a toxin that specifically binds claudin-3 and claudin-4. The claudin family consists of approximately 23 proteins that are essential for the formation of tight junctions (TJs) in epithelial and endothelial cells . TJs have crucial roles in the control of paracellular transport and in the maintenance of cell polarity. It is thought that various claudin family members can confer different properties to epithelial cell permeability and account for some of the selective variability of different barriers . Indeed, most tissues express multiple claudins, which can interact in both homotypic and heterotypic fashion to form the tight junction strands. The exact combination of claudin proteins within a given tissue is thought to determine the selectivity and strength of the tight junctions. Underscoring the critical roles of claudin proteins are recent observations that germline mutation in these genes can lead to various familial diseases, such as neonatal sclerosing cholangitis (CLDN1) , nonsyndromic recessive deafness (CLDN14) , and familial hypomagnesaemia (CLDN16). Recent gene expression profiling analyses have shown that claudin gene expression is frequently altered in various cancers (reviewed in [5, 6]). For example, CLDN3, and CLDN4 have been found frequently up-regulated in ovarian, breast, prostate and pancreatic tumors [7–11]. CLDN7 has been found downregulated in breast and head and neck cancer, but elevated in stomach cancer [12, 13]. CLDN1 is typically downregulated in various cancers, but has also been reported to be elevated. The picture that emerges suggests that claudin expression is altered in several human tumors. Specifically, CLDN1,3,4,5,7,10,16 have been found altered in various cancers . The overexpression of these proteins in cancer (which typically lose their TJs) is unexpected but may be related to roles that are unrelated to TJ formation . Indeed, recent work suggests that claudins may be involved in survival and invasion of cancer cells [12, 14, 15]. Regardless of their exact functions in cancer cells, claudin protein expression may have significant clinical relevance [5, 6]. For example, claudin-1 expression has been shown to have prognostic value in colon cancer , claudin-18 in gastric cancer , and claudin-10 in hepatocellular carcinoma . In addition, because claudins are surface proteins, they may represent useful target for various therapeutic strategies. Of particular interest, in the possible use of Clostridium perfringens enterotoxin (CPE) as a novel chemotherapeutic compound. CPE is a natural ligand for claudin-3 and -4 proteins, and binding of the toxin to these claudins leads to a rapid cytolysis of the cells . Recent preclinical studies have suggested that CPE may be effective against claudin-3 and -4-expressing malignancies [8, 9, 11, 20]. Unfortunately, the exact patterns of expression of the various claudins in different cancers and normal tissues are not well known. To date, only a few of the claudin proteins have been investigated in a relatively limited number of cancers. In this report, we use the vast amount of data present in the public SAGE database to create a claudin gene expression profile of all the known claudin genes, in a large number of tissues. We then survey a subset of these claudin genes using real-time RT-PCR in a panel of normal and neoplastic tissues. Our study confirms previous claudin gene expression patterns and identifies new ones, which may potentially be of clinical use for various cancers. 21 human claudin genes and corresponding proteins sequences were identified and downloaded from GenBank. The ClustalW software (with the Blosum62 matrix) was used to produce a multiple sequence alignment of all these human claudin protein sequences and the Jalview software was then used to visualize the results . A phylogenetic tree of the claudin proteins was produced with ClustalW. The clustalW phylogenetic calculations are based on the neighbor-joining method of Saitou and Nei . Mining of the SAGE Genie database  for libraries that expressed GAPDH or ACTB yielded a total of 266 SAGE libraries with at least some level of expression of these control genes. These libraries were then examined for the expression of all 21 human CLDN genes that we identified. SAGE data for both normal and cancerous tissues was exported to an excel spreadsheet, and expression levels converted to tags per 200,000 (the complete dataset is available as additional file 1). The dChip software http://www.dchip.org program was then used to visualize this data, assigning darker shades of red to higher number of tags. A total of 48 cDNA preparations from various normal and neoplastic tissues (24 each) were purchased from Biochains (Hayward, CA). The GeneAmp 7300 Sequence Detection System (PE Applied Biosystems) was used for detecting RT-PCR products in real-time with the SYBR Green I assay, as previously described . The primers for the various CLDN genes (CLDN1,2,3,4,5,7,8,9,10,11,12,16,18) and the control GAPDH were designed to cross intron-exon boundaries to distinguish PCR products generated from genomic versus cDNA template. For CLDN genes lacking introns, real-time RT-PCR was performed by the polyA cDNA-specific RT-PCR method . The primer sequences are available online as additional file 2. Each PCR reaction was optimized to ensure that a single band of the appropriate size was amplified and that no bands corresponding to genomic DNA amplification or primer-dimer pairs were present. The PCR cycling conditions were performed for all samples as follows: 50°C, 2 minutes for AmpErase UNG incubation, 95°C, 10 minutes for AmpliTaq Gold activation, and 40 cycles for the melting (95°C, 15 seconds) and annealing/extension (60°C for 1 minute) steps. PCR reactions for each template were done in duplicate in 96-well plates. The comparative CT method (PE Applied Biosystems, Foster City, CA) was used to determine relative quantitation of gene expression for each CLDN gene compared to the GAPDH control. First, the CT values from GAPDH reactions were averaged for each duplicate. Next, the relative difference between GAPDH and each duplicate was calculated as previously described . The final values were then averaged for each duplicate set, and used in the dChip analysis. Clustering of the CLDN genes was performed with distances based on 1-rank correlation and the centroid linkage method. As a starting point for our analyses, we identified 21 different human claudin proteins in the GenBank database. Alignment of these 21 sequences using ClustalW shows that most of the claudin proteins are extremely similar, especially in the membrane-spanning regions (Figure 1A). Notable exceptions are claudin-16, which contains a 66 aa extension at the N-terminus, claudin-18, which has an extension in the second extracellular loop, and claudin-23 with a longer C-terminal tail. A phylogenetic tree was also generated to better identify similar members of the family. Overall, the tree demonstrated that the claudins constitute highly related family of proteins, with claudin-16, and -23 being the most different from the others (Figure 1B). Claudin-6 and -9 are the most similar, followed by claudin-3 and -4, and claudin-1 and -7. Multiple alignment and family tree of claudin proteins. A. ClustalW was used to generate alignment of all the human claudin protein sequences and the residues were then colored using Jalview  according to amino acid conservation among family members. Red bars underneath alignment indicate predicted transmembrane domains. The level of conservation and the consensus are also shown below the alignment. B. Phylogenetic tree of claudin family members. The tree was generated using ClustalW and visualize in Jalview. The numbers on the branches are Blosum62 scores, indicating distances among family members. Because serial analysis of gene expression (SAGE) measures absolute levels of transcripts, cross-comparison of SAGE data is possible across experiments and laboratories . The SAGE Genie database has been developed to allow in silico analysis of gene expression and comparison of transcript levels in a large number of normal and diseased tissues . Using the SAGE Genie database, we extracted gene expression data for all 21 human claudins across 266 tissues (Figure 2 and additional file 1). Some of these genes, such as CLDN1,2,3,4,5,7,11,12, and 15 are expressed in a large number of different tissues. In contrast, other claudins, such as CLDN14,16,17,20, and 22 have much more restricted expression patterns. CLDN17, for example, was found expressed in only one SAGE library (normal kidney), at low levels. CLDN20 was only found in 3 cancer libraries total (a chondrosarcoma, a brain cancer, and a liver tumor). Similarly, CLDN22 was only found in 2 breast cancer libraries and one brain astrocytoma library. On the other hand, CLDN3,4, and 7 were highly expressed in most normal epithelial cells as well as their corresponding neoplasias. Further analysis suggested that these claudins are frequently elevated in cancer. For example, CLDN3 was elevated in tumors of the lung, prostate, breast, kidney, and ovary compared to their normal counterparts. Similarly, CLDN4 was elevated in tumors of the lung, breast, stomach, pancreas, and ovary. CLDN7 was elevated in cancers of the thyroid, lung, stomach, pancreas, liver, kidney, and ovary. Interestingly, CLDN6 was frequently expressed in embryonic stem cells (ESCs) but generally not in other tissues. CLDN7 was the only other CLDN expressed at significant level in ESCs. CLDN18 expression seemed to be mostly restricted to the stomach and the lungs. Vascular endothelial cells expressed CLDN5 at high levels, suggesting a new target for antiangiogenic therapy. Brain had distinctive claudin expression profiles, with CLDN3,4 and 7, expressed at low levels but CLDN2 and CLDN5 very highly expressed. This pattern was opposite to what we observed in epithelial cells. CLDN12 was the most widely expressed gene and appeared expressed constitutively in most tissues. 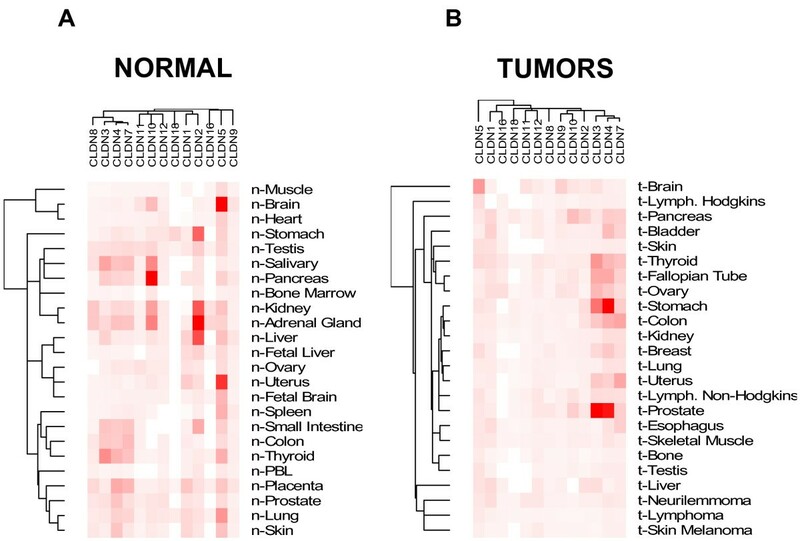 In silico analysis of claudin gene expression in various normal and neoplastic tissues. 266 SAGE libraries were examined for the expression of all 21 CLDN genes using SAGE Genie . SAGE data was compiled from both normal and cancerous tissue, and analyzed using dChip software http://www.dchip.org program, which assigned darker shades of red to higher number of tags. GAPDH and ACTN levels were also analyzed as controls. While some CLDN genes are ubiquitously expressed, others exhibit highly tissue specific patterns. A detailed spreadsheet of the data is available as supplementary information. In order to validate and extend the in silico results obtained with the SAGE Genie database, we performed real-time RT-PCR analysis on a subset of CLDN genes (13 genes total) to survey gene expression in several tissues. Gene-specific primers for CLDN1,2,3,4,5,7,8,9,10,11,12,16,18 were designed and optimized. These CLDN genes were chosen because they were expressed at detectable levels in several tissues and represented a wide variety of different expression patterns as suggested by the SAGE database analysis. A total of 24 normal tissues and 24 tumors were surveyed for CLDN expression (Figure 3). Using this technique, we find that the various normal tissues express a wide variety of CLDN genes (Figure 3A). For example, the kidney expresses high levels of CLDN10 and CLDN12, but also expresses some levels of all the other CLDN genes tested (with the exception of CLDN18). Clustering of CDLN genes showed a tight association of CLDN3,4,7 in terms of their expression patterns, suggesting a coordinate regulation of these genes. The CLDN3,4,7 cluster was found expressed at high levels in normal pancreas, salivary gland, kidney, adrenal gland, small intestine, colon, and thyroid. Examination of the tumor samples revealed that the diversity of CLDN expression was decreased in these samples (Figure 3B). Except for the CLDN3,4,7 cluster, which was also present and often elevated in tumors, the other CLDNs appeared to be expressed at relatively low levels. CLDN3,4,7 were expressed in tumors of the pancreas, bladder, thyroid, fallopian tubes, ovary, stomach, colon, breast, uterus, and prostate. Because of the low number of samples examined, this survey doe not represent an exhaustive analysis of CLDN gene expression in various tissues but rather an initial study of tissue specificity. However, the similarity in the gene expression patterns identified through this survey and previously known patterns (for CLDN3 and 4, for example) is striking. Additional studies with several tumors, including various subtypes, grades, stages, and other clinical parameters will be necessary. Real-time RT-PCR survey of CLDN gene expression in normal and neoplastic tissus. Expression data of 13 selected CLDN family members from 24 normal and 24 tumor tissue cDNAs. The dChip software was used to analyze and cluster the data. Clustering of the CLDN genes and the tissues were performed with distances based on 1-rank correlation and the centroid linkage method. Darker shades of red indicate higher CLDN expression. Alterations in the expression levels of tight junction proteins, especially claudins, continue to be reported in several cancers. However, an overall view of claudin gene expression in normal and cancer tissues has been lacking. In this report, we first use the large public SAGE database to investigate claudin expression of the 21 human CLDN genes we have identified in GenBank. We find that, while some CLDN genes are ubiquitously expressed, the majority of these genes exhibit a very restricted expression pattern. CLDN14,16,17,19,20, and 22, for example, are found in only a few rare libraries. Others such as CLDN3,4,5,7,11, and 12 are much more widely expressed. Our analysis allows for the identification of general expression patterns, such as the high expression of CLDN3,4 and 7 in epithelial tissues, and lower expression in other tissues, such as the brain. Our data also reveal claudin expression patterns that were not previously known and that may have clinical implications. According to our data, gastric cells (both normal and neoplastic) express high levels of CLDN18, while other tissues do not express this gene. Interestingly, a recent study shows that claudin-18 is highly expressed in normal gastric cells and that this high expression is retained in approximately half the gastric tumors . Because of its highly restricted pattern, claudin-18 may therefore represent a useful target for therapy of gastric cancer, especially in those tumors that maintain high levels of this gene. Claudin-18 is likely involved in TJ formation in normal gastric cells, while cancer cells, which typically do not form TJ's, may have a more available form of claudin-18. Therefore cancer cells may be more sensitive to therapy involving the targeting of this molecule. We also find that CLDN5 is not generally expressed in epithelial tissues but is expressed at high levels in all vascular endothelial cell libraries analyzed. Although also expressed in the brain, CLDN5 may represent a target for antiangiogenic therapy, especially if using compounds that cannot cross the blood-brain barrier. Our RT-PCR experiments provide a more quantitative look at claudin gene expression in several normal and neoplastic tissues. It is important to note that these RT-PCR investigations do not represent an exhaustive study of CLDN gene expression, but rather a survey of expression in a large number of different human tissues. Follow-up studies on multiple samples for these different malignancies will be necessary to clearly establish the extent and levels of expression of claudins in these tissues. However, it is important to note that the patterns of gene expression obtained by real-time RT-PCR (Figure 3) closely mirrors the in silico findings using the SAGE Genie database (Figure 2). For example, the CLDN3 and CLDN4 expression patterns are consistent between the two analyses (as described above). In addition, we also observe high correspondence in the two approaches when examining CLDN5 expression, which appears to be especially high in normal brain and brain cancer. Interestingly, when clustering our RT-PCR data for gene expression patterns, we find CLDN3,4,7 are very similar in their expression, suggesting coordinate regulation. The fact that the CLDN3,4,7 cluster is present in both normal and tumors suggests that the mechanisms that lead to the coordinated expression of claudins in normal cells is conserved in tumor cells, although it may be inappropriately activated in cancer. It will certainly be interesting to elucidate the mechanisms that lead to the inappropriate activation of these genes. Our in silico and RT-PCR results are consistent with numerous previous reports showing that CLDN3 and CLDN4 are overexpressed in breast , ovarian , and prostate tumors . In addition, our data showing overexpression of CLDN4 in pancreatic cancer is also in agreement with previous reports [8, 27]. The finding of expression of these claudins in other tumors, such as bladder, thyroid, fallopian tubes, stomach, colon, and uterus, is novel and warrants further investigation. CPE-based therapy, which specifically targets cells expressing claudin-3 or claudin-4 [8, 9, 11, 20], may be worth exploring in these malignancies as well. The fact that CLDN3, and CLDN4 are expressed in several normal tissues (Figure 3A) certainly suggests that systemic administration of CPE may have significant toxic effects. However, the therapeutic index of this compound will depend on the level of up-regulation in the various tumors under study and the mode of administration. In ovarian cancer, for example, where both CLDN3 and CLDN4 are highly up regulated and where intraperitoneal therapy is possible, CPE treatment is certainly an interesting possibility. 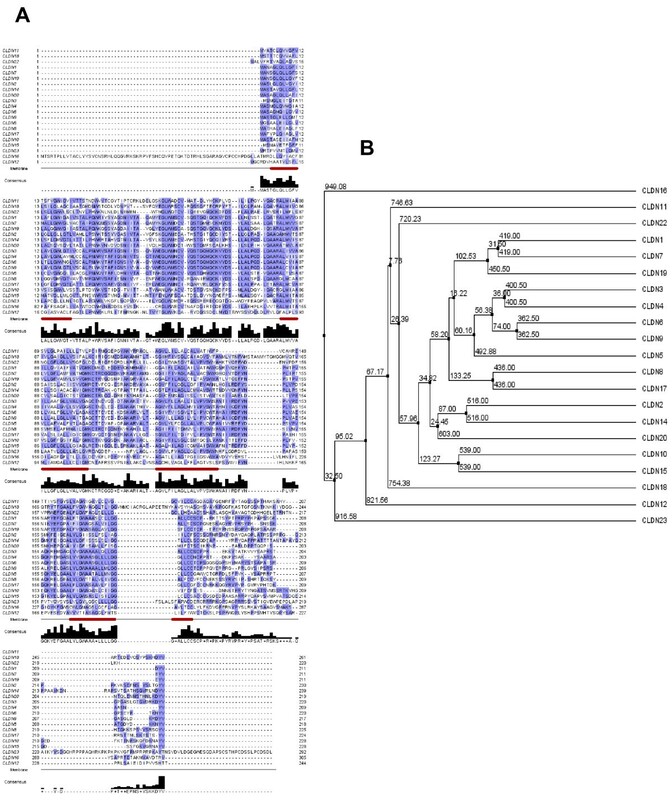 In this report we study the expression of the CLDN genes at the mRNA level, but it will obviously be essential to validate these findings at the protein level when all the antibodies are available, as posttranslational mechanisms have been shown to regulate claudin protein levels and localization . In addition, it will be important to investigate the various claudins studied here for their potential clinical use in cancer therapy and diagnosis. With over 20 known members, many of which, as we show in this report, exhibit high tissue-specific expression and deregulation in various cancers, the claudin family of membrane proteins may represent ideal targets for cancer diagnosis and therapy. Systematic analysis of CLDN gene expression using in silico and RT-PCR approaches demonstrate a wide range of expression patterns among the various claudins in human cancer. CLDN3, CLDN4, and CLDN7 are elevated in several malignancies such as those originating from the pancreas, bladder, thyroid, fallopian tubes, ovary, stomach, colon, breast, uterus, and the prostate. These cancers are thus ideal candidates for a for a novel therapy being developed based on CPE, a toxin that specifically binds claudin-3 and claudin-4. CLDN18 is specifically expressed in gastric cells and may represent a marker for gastric tumors. CLDN5 is highly expressed in vascular endothelial cells, providing a possible target for antiangiogenic therapy. Overall, a better knowledge of claudin expression in normal and neoplastic tissues may provide new opportunities for the detection, prognosis and therapy of several human cancers. We thank Drs Hiroshi Honda, Ashani Weeraratna, Theresa D'Souza, Jianghong Li, and Cheryl Sherman-Baust for useful comments on the manuscript. This research was supported by the Intramural Research Program of the NIH, National Institute on Aging. KJH: Performed RT-PCR experiments, multiple alignments, and drafted a first draft of the manuscript; RA: Designed and tested some of the primers for the RT-PCR experiments; PJM: Designed and coordinated the study, interpreted the data, and drafted the manuscript.